C³-bu, in a word, is confused. It doesn't know what it wants to be. Is it a slice-of-life about cute girls shooting cute guns? Is it a story about how the main character loses sight of what's really important while chasing a dream and how she works to gain it back? Is it a tale of the supernatural link that a girl has with an ancient Japanese warrior and how she uses her power to change the world? The answer is none of the above. It is instead a jumbled mishmash of all three. Due to their radically different themes they end up coming together like chocolate, steak, and curry in a blender. The slice-of-life episodes have little to comment on. If you like cute girls and/or airsoft then watch them, they're well-done for what they are. The supernatural element has only one major episode, number 4. It's brought up again twice near the end but never mentioned throughout the large majority of the series. The fact that they included the paranormal theme at all is mind-boggling. When they brought it up in episode 4, the watcher is led to believe that it will be the focus of the show. Yet it in fact makes absolutely no impact on the plot whatsoever. However, it's still done beautifully, and is in my opinion the best episode of the show. The plot-driven episodes are quite good. Yura and Sonora (and to a lesser extent Rento and Rin) get some character development, and although the other characters are just there to fill out the cast and are underdeveloped it doesn't detract much from the plot progression. Although its end is less than fantastic they're worth a watch. You may read this and think "This all sounds pretty good!" Well, that's because it is. Each individual element is good but they don't mix together very well. You may be wondering why all of these differing ambitions seem at odds with each other in the show. (Note: the following is speculation.) This rampant disorganization is likely due to C³-bu being Kawajiri Masayoshi's directorial debut. With no offense meant to the man, his filmography outside of C³-bu consists of only one lone entry - doing background art for Dantalian. However, the individual episode directors all have more experience than Kawajiri. Many have worked on very notable shows like Cowboy Bebop, Code Geass, Gurren Lagann, etc. etc. As his first time directing a series, especially with little other experience under his belt, one can see how he might have had trouble keeping reins on the episode directors and making it so that the whole series has overarching themes rather than just having them crop up and then disappearing. As I see it, there are four ways to watch C³-bu. 1. Watch episodes 1-3, 5-6, and 12-13 for SoL with girls and airsoft. 2. Watch episodes 7-11 if you're more into plot and want a decent story of suffering and redemption. 3. Watch all of episode 4 and 17:00 to 20:35 of episode 11 if you want an interesting supernatural oneshot. 4. Watch everything from episode 1 to 13 if options 1, 2, and 3 all sound appealing. You can watch it for the entertainment value and appreciate it for what it is - a highly flawed show that was poorly directed, but has some legitimately good material despite its shortcomings. The idea of a group of cute girls doing cute things isn’t exactly an original idea in today’s anime industry. Series such as K-On!, Saki, and Bamboo Blade are just a few to name. Even more recently, series such as Upotte and Girls und Panzer even added the addition of weapons to its tropes for more flavor. I mean, cute girls with deadly weapons at at hand tends to make a show more interesting right? Well for Stella Woman’s Academy, there’s the concept of airsoft guns and with that comes a new twist of entertainment. The series stars Yura Yamoto, a freshman with a shy personality from an unknown middle school. What we do know though is that her past isn’t exactly one of those happy memories where we like to witness over and over. No, in fact Yura’s past seems to be clouded by darkness because of what we see is cases that can induce pity and sorrow. But hey, now she is fresh and can start over. The start begins here at Stella Woman’s Academy. As the school is all-girls school, the club at the academy is made up of all girls with the one and only leader Sonora. She is an effective leader with her enthusiasm, skills, and personality that makes her likable by her teammates. We can’t exclude the other characters though because a team needs support and everyone pours their skills to achieve victories. Whether it’s supportive unit, close range combat expert, ace sniper, or commander, everyone plays their roles in battle. As for Yura, she is a newbie in the beginning. After all, everyone starts out like that. Sonora wasn’t born a leader, Honoka wasn’t born as a commander, and the rival of the C3-Club Rin Haruna, wasn’t born an ace of Meisei Girls’ Academy. The plot focuses on various ideas all packaged into this fun series. As part of that package, we witness Yura’s development throughout the show for both physically and mentally. She starts out as a newbie but is able to adjust and earn the respect of her teammates. Her vivid imagination allows her to picture an airsoft game as if it’s a real battlefield that puts her skills at ease. But as development goes, we later witness a drastic change in her character that might be displeasing to bear. By technical standards though, Yura's character shifts almost 180 degrees and is presented as almost a brand new person that makes it very frurstrating to watch. Because there is airsoft, also expect competition. That competitions from the various teams encountered throughout the series. Perhaps the most prominent of these competitions though is from Meisei Girls’ Academy. The leader of that school known as Rin Haruna is a girl of stoic nature but presents an intense display of skill at airsoft. More importantly though, she has a history with the ace of the C3-Club Sonora. Whatever went down between the duo obviously wasn’t a pleasant experience and viewers might have different reactions upon witnessing their flashbacks. Even with competitions though, there’s still the fun. You ever heard your sports coach say something along the line that “the most important factor in a game is not just winning but also to have fun?” Well, this show presents that in a simple way as we witness the girls do their best but at the same time seems to enjoy each and every game regardless of the result. ; at least, this applies to most of the time. For Yura though, it might be a difference case for later on, she becomes so intensively focuses that the fun might be taken out of the games. In fact, it can be a bit surprising to see how much she has changed. As it fun wasn’t enough though, I do appreciate the comedy of this series. There’s random gags and personalities with each of the various characters. In particular, I find Sonora’s tomboyish personality to be an eye catcher and the way she motivates her teammates. Other instances includes the character interactions of the C3-Club ranging from various degrees of humorous moments. There are also episodes involving certain events too like a beach or festival episode. Speaking of beach episode, it’s also time to take those clothes off and have more fun in the sun! I am not an expert at airsoft games in real life but the concept of some of the weapons involved in this show seems to shine in that aspect. Throughout the series, various weapons are shown in action including Desert Eagles, Vz. 61 Skorpion, P90, G36K, Ak-47, and M60. Technically speaking, this show tries to even follow the actual concept of airsoft with a sense of realism. This can be seen later on with new additions added to these airsoft games. More importantly though, we witness Yura’s new style in these games that can be quite contrasting than we we were originally used to. Unfortunately, the overall tone of the show jumps around quite a bit and loses its style. Its inconsistency comes from Yura as well as the overall construction of its poor story. Despite conflicts being resolved, the problem lies with the characters themselves and the journey they take. That journey is marked with holes that are hard to fill with oddly directed episodes, weak climax, and cheesy dialogues . The conclusion itself also can leave viewers scratching their heads on "why did this anime end sooner?" There's also a bit of repetitiveness that makes this show unsatisfactory at various standards. In terms of visuals, the series spells out cuteness with the designs of the characters. Even Sonora, the leader of the C3-Club has a dose of that. On the other hand, Rin is designed with a typical dark beauty-like stance given her stoic personality. Meanwhile, the guns themselves looks real enough but at the times hard to take seriously with the way the characters uses them. The school itself is also hardly noticeable either. Gainax is already known for some of their previous works revolving around schools like Hanamaru Youchien, Medaka Box, and Corpse Party. Their artistic visuals aren’t exactly what I would call a masterpiece so this show doesn’t stand out much either in the art department. Soundtrack is average but often times throws off balance. The OP song “Shape My Story” by Anna Yano is noticeable though not only for its tone but also for its artistic visuals near the end of the song. On the other hand, the ED song of this series is a bit laughable with the moe character designs and rhythms. Almost all the characters’ voices fits with their roles although I give praise to Sonora’s VA Miyuki Sawashiro (Blast of Tempest, Kokoro Connect, Maoyu) praise because the way she is able to portray a tomboyish character and at the same time able to carry the task as a leader. For me, this show was a balance between cute, intense, and entertainment. By cute, I don’t mean girls spending their time drinking tea all day or performing like idols on stage. Rather, they are able to enjoy an activity known as airsoft. In a sense, they portray the antithesis of the typical frail women. The show might be a bit repetitive to watch however. At the same time, do take notice of Yura’s character transformation as a bit of backlash to her original self in the beginning. Whatever the case though, this series isn’t just about airsoft games but about these girls having fun at what they do. You don’t actually need to be an airsoft expert to watch this show. Hell, I have almost zero knowledge in the field of airsoft games but decided to give this a shot. What I got though was a 60% fun experience, 40% letdown. There have been many successful shows using cute girls and heavy machinery such as Girls und Panzer or even So Ra No Wo To. But nothing left me as disappointed as Stella Jogakuin Koutou-ka C³-bu. I consider myself a Slice of Life fan with reasonable tolerance for slow paced, low action rate type of shows and therefore had some expectations for this Anime for the summer. But boy oh boy this show felt like a one way rollercoaster, and it wasn't going up that's for sure. For the first couple episodes we are introduced to this Highschool club type of setting that's not uncommon, where these 5 girls play with airsoft guns against each other as club activities and we are welcomed to the C³-bu. On the other end we have the somewhat antisocial protagonist Yura Yamato who is struggling to fit into the all girls school she just recently transfered to in hopes she will be able to make new friends and change herself to become a better person. What she soon realises is that everything is still the same and no one really wants to talk to her, which is never explained why, perhaps just her own awkwardness and unability to communicate with others. But this isn't an unpopular feature in shy protagonists so there's nothing too bad here. As cliché as it sounds, Yura ends up in the same dormitory room as one of our main characters, the C³-bu president Sonora, and there she is introduced to the world of airsoft guns by watching Sonora's DVDs about the military and playing with her guns. Soon after this she is invited to join the C³-bu from the other members and participates in a match with them to test it out. And of course there we are introduced to the airsoft world for the first time and much like other simple sports anime such as Saki there are some odd elements involved aside from the game itself, though this is put really bluntly and not explained in the slightest. After this trial is over and a lot of hard deliberation by Yura she decides to enter the C³-bu because she felt like she was accepted there. And thus the adventure of these 6 girls and their airsoft gun filled highschool life began. It wasn't that bad of a premise to start a show and could have worked out, until they completely changed the formula to seem like they purposely wanted you to hate the show. At their first match against another highschool Yura meets her antagonist Rin who also happens to be Sonora's somewhat close friend. In this match she realises how powerless she is when compared to everyone else, and thus begins the downfall of this Anime. Yura, our nice cheerful protagonist who just wants to have fun begins to deteriorate and becoming one of the most despicable characters in the show. Everything you could have liked her for will suddenly disappear and you will be left with this dull and spiteful "protagonist". You're better off paying attention to all the side characters if you want some form of entertainment other than the soap opera this show becomes. She starts being determined for all the wrong reasons and the viewer has no will to support her whatsoever. It's as if this show suddenly turned our protagonist into the worst kind of person that's as dense as a brick and can not differentiate right from wrong. As a result of this sudden change we are left with half of the series showing Yura being selfish and everyone else around her being depressed, and the show follows this formula until the very last episode. It was a real drag to put up with and not worth the time and effort. There is no main plotline, it sort of was thrown away in the middle of the series. It's basically like a really bad soap opera with airsoft guns. Forcing your viewers to wait through painful episodes that have barely any to no development in character and are just focused on Yura being a terrible human being is not okay at all. I guarantee you you will like the antagonist more than the protagonist. I sure did.. This show has no direction whatsoever for episodes and episodes. The poor story and even poorer characters made me want to bash my head against my desk every time I was watching an episode. I had to check how much time had passed every 5 minutes to see how long it'd take until it was over. The Anime had no regard to plot or story and just left us viewers with an awful protagonist and a bunch of plot holes. But not everything is doom and gloom. 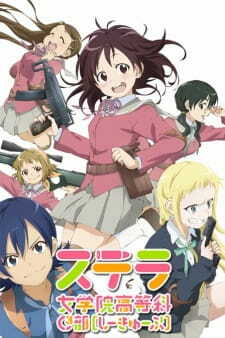 What you can however enjoy from this show (and probably the only thing good about it) are the rest of the characters that convey a happier and more bright feeling to the viewer, with their positive attitude and their determination while still having fun doing what they do best which is playing airsoft matches. Had the show made the protagonist do the same as every other character I would have had no problem with it, it would have become an interesting Slice of Life about girls having fun within their club activities. But now all I am left with is a huge wave of disappointment for the genre. The soundtrack isn't anything out of this world and both the opening and ending sequences are bright enough for it's genre. The art isn't anything over the top and the color range is pretty bright which thank god it was or else I have no idea how I could have withstand all these episodes if the art wasn't decent. The overall physical aspect of the show is reasonable and acceptable and should not be a pain for anyone to watch using today's standards. Overall, Stella Jogakuin Koutou-ka C³-bu was a show that promised something and did not deliver, much like many shows out there. This is not unusual for the Anime industry, there's always some shows that are bound to fail and in my opinion this one was one of them during the 2013 summer. I'm thankful it does not have the Slice of Life tag or the Comedy tag in it, that would have been an insult to the genre but it is what this show is trying to pass by as using all the bright and cheerful elements. If it's one genre this show needs to add is Drama, it completely turned into a sappy soap opera after some episodes and completely plummethed into oblivion as the protagonist that is supposed to be the core of the Anime turned into the most hateful subject of all. If you really like military themes or even sports, I personally do not believe this show delivers it but if you really want to watch a sappy drama about girls and airsoft guns you're free to try this one out. The only positive aspect I have about it are the other main characters which made me appreciate the show a little, nothing less and nothing more. If you've been around the anime community for long enough, you have no doubt heard of the so called "Moe" genre. With a focus on cute girls doing cute things, (usually in a high-school setting) Moe series tend to focus more on comedy and various slice-of-life situations then plot and character (See: K-On! and Lucky Star for two very popular examples). But what happens when a show that has seemingly "Moe" characteristics attempts to delve into deeper themes, such as self-worth, the struggle to become a better person, and the consequences of your actions? In that case, we get a show like C³ (Full title: Stella Jogakuin Koutou-ka C³-bu). To get this out of the way early, the production values in C³ are perfectly fine for this sort of anime, with the art and character designs being nice and unobtrusive, and the music especially being surprisingly good. To be honest, the art isn't spectacular by any means, but given that this show at its core isn't really about the action (or anything else that would be worth taking considerable time and money to animate) the animation does its job well, maintaining a consistent level of quality. Produced by Studio Gainax, (makers of popular shows such as Neon Genesis Evangelion, FLCL, Gurren Lagann, etc.) C³ seems pretty simple at the outset, featuring an all-girls school that our protagonist, Yura Yamato, is just beginning to attend. Yura has had trouble making friends and standing out in the past, and she is determined to change herself and become more outgoing at this new environment, to have a fresh start, if you will. But despite this resolve, she finds herself incapable of following through, failing to speak to any of the other girls that she encounters or to meet any new people. It isn't until she is scouted by the school's airsoft team, C³ (that stands for Command-Control-Communication, if you were wondering) that she begins to find the determination to change. By participating in these airsoft games, (aptly called "survival games" by the team members) Yura is able to make new friends, discover new passions, and strengthen her resolve to better herself as an individual. It is through this airsoft team, and the opponents that they face, that we meet the rest of the characters. To be honest, the majority of them are mostly there just to fill up space, but they do this job adequately, adding some comedy and lightheartedness to the series at some points, and acting as good symbols of how people perceive the actions of certain characters at other times. But more notable than them is Sonora, Yura's upperclassman/roommate, and the leader of the airsoft team. Sonora acts as a sort of mentor to Yura, guiding her through the basics of airsoft and giving her the confidence she needs to join the team, as well as the resolve to continue playing and to make the best of the games. Also notable is Rin, a star player for the Meisei academy airsoft team, and a girl who has some strange ties with Sonora's past. These two characters both have a strong impact on Yura's development as a character, each of them providing various insights that both help or hurt her as she goes along. This technically being a sports anime, the theme of "It's not just about winning or losing" is definitely alive here, but it's addressed in different ways by different characters, and Yura most of all struggles with determining its true meaning, and finding a balance between Sonora's and Rin's methods. It is this development with Yura's character and set of themes that differentiate C³ from other shows of "cute girls doing cute things", and even a lot of other sports anime, but on the opposite end of the spectrum, Yura's character is also what makes the show's greatest flaws apparent. Yura in the beginning of the show is, as previously mentioned, a rather lonely soul, a girl who craves friendship and affection, but is not outgoing or brave enough to actively seek it. Through C³, she is able to slowly reform herself, getting braver, more determined, and "stronger". But what happens when these changes go to far? Two things happen: For one, the show becomes quite interesting, as we get to see a show that was formerly about a bunch of cute girls playing airsoft games for fun turn into a character study regarding how Yura's transformation obviously goes to far, and whether or not she can redeem herself. Second, the plot and characters begin to act slightly illogical in order to allow this to happen. Truly, Yura's struggle IS interesting, and it kept me engaged, but there were a few occasions where Yura obviously showed awareness that she was going to far, but did nothing to stop herself. Despite her own realizations, and the pleading of the very friends she wanted so badly, she still continues down a path that can only lead to her destruction, and the show does a poor job of giving us a solid reason as to why. This sudden transformation in the show's focus also leaves it feeling a bit disjointed, as it practically feels like two different shows between the first and second halves. Personally, I enjoyed seeing the slow buildup towards the sudden shift in tone, but it's disappointing that it falters right at one of the most important moments for Yura's character, and it feels like had the show focused a bit more on the serious side of things, it may have been able to provide more logical reasoning for the events that take place. And ultimately, this is C³'s problem: It is a mish-mosh of ideas thrown all together, with the focus shifting around constantly, as if in a mad dash to get to the next topic before time runs out. Important events happen, interesting themes are brought up (including a sort of fantasy-realm that ties into the real world), but they are ultimately brushed aside to get onto the next major plot point. Had C³ JUST been a slice of life comedy, it probably would have been a fairly good one. Had it JUST been a show about self-loathing and redemption, it probably would have been pretty competent. But it also would have been something that we've seen in other shows plenty of times before, and likely done better. It's C³'s willingness to play off our expectations and try to surprise us that makes it special, that makes it stand out among all the other slice of life/redemption stories out there as something unique. Even if it could have technically been better had it stayed focused on one theme or genre, it would have been nowhere near as special to me, and I for one commend it for the risks it takes, even if the result of said risks didn't always turn out spectacularly.